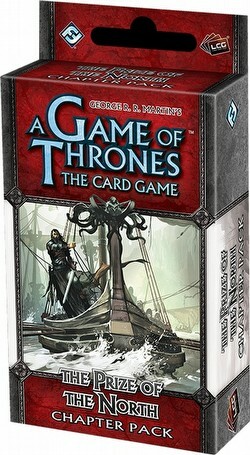 The Prize of the North is the fifth Chapter Pack in the Conquest and Defiance cycle for A Game of Thrones: The Card Game. This Chapter Pack continues the cycle's major themes, introducing fourteen cards with the Prized keyword and giving additional support to the possibility of multi-House or Neutral Faction decks. Every Great House in Westeros gains powerful cards, including a new Sand Snake for House Martell, powerful Warships for House Greyjoy, and three Prized dragon egg attachments for House Targaryen! Each pack includes 60 cards (3 copies of 20 different cards).